An excellent update, bringing yet more power, quality and innovation to Cubase. Mixer revamped at long last. Channel Strip rocks! Chord Track/Assistant are inspirational. VST Connect SE for remote recording. CurveEQ is a crash course in mixing. No mixer/plugin undo! Overstuffed MixConsole needs scrolling. VST Connect SE video can be flaky. Snow Leopard users will need to update. A year ago brought us Cubase 6.5, a mere point release, yet one stuffed full of new goodies including two of the best instruments the company have ever bundled in. Unusually, this was a paid-for point update, but it followed in the footsteps of Steinberg's established full version update formula: a handful of new instruments and effects, some nips, some tucks and a few eye-popping features. 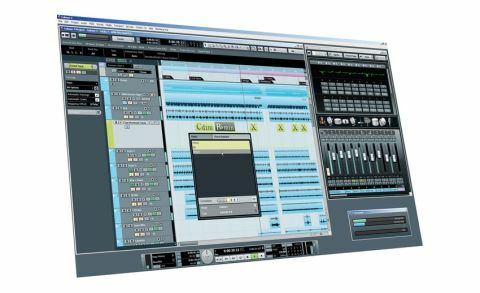 "Times have changed in the DAW scene, with some competitors offering quite radical updates"
Steinberg's updates have, of late, been designed to open users' wallets with the promise of creative inspiration, while rarely delivering the sort of sweeping changes that would rattle them or have them scrambling to the user manual. But times have changed in the DAW scene, with some competitors offering quite radical updates - see Propellerhead's introduction of full audio editing/recording and plugin Rack Extensions to Reason, or Cakewalk's deep rework of Sonar as Sonar X1. Elsewhere, you have newcomers like PreSonus Studio One and even the upcoming Bitwig Studio that are not tied down to years of established convention. Some might say that Cubase has been looking slightly stodgy in comparison; others might champion its familiarity. If you're in the latter camp, you may be taken aback by some of the sweeping changes that have come to Cubase in this new version. However, we've been spending a lot of time with it and can assure you that the new features are nothing short of inspirational. "There are tons of new features in Cubase - and the new MixConsole is probably at the top of the list"
There are tons of new features in Cubase - far too many to cover in our review. Of those that demand specific attention, the new MixConsole is probably at the top of the list. Yep, Cubase 7's new mixer is so drastically different from the previous version that they've seen fit to rename it. A few minutes of poking around reveals that this is indeed an entirely new concept for Cubase and one that, frankly, makes the old mixer seem like a limited relic, albeit a slightly more immediate one. That old mixer was relatively fixed. You could collapse the bits you didn't want to see, toggle showing inserts, EQs, sends, etc, and you could have three different mixers available at any time. However, for the most part, the size of all of these elements wasn't adjustable. The new MixConsole is entirely configurable and can be expanded to fill your entire screen. The Visibility/Zones column enables you to decide not just which channels you want to see but in what order they should be arranged. You can show (and grow) only the fader sections, for instance, or toggle a notepad for each channel, channel overview and more. Old tools like in-line EQ curves and large meters are still available. The new Channel Strip isn't just an element of the MixConsole but is also available when viewing the Channel Settings window. In fact, we prefer accessing it this way as it gives a better overview than the narrow vertical display in the MixConsole, enabling you to see all its five sections at once without scrolling. You can arrange them in any order you like; some offer variations on a theme, while others do one job. The Noise Gate comes first, with its Threshold, Attack, Release, Freq and Q controls - just enough to do the job in a hurry. There's also a Saturation section, offering Tube and Tape modes, both of which give you control over drive, output and low- / high-pass filtering. Then there's an Envelope Shaper with - as you'd expect - Attack and Release knobs, along with Length and Output controls. The Compressor section provides Tube, Vintage, and Standard models, each with its own collection of controls. The one that impressed us most was the Vintage - although it offers only Attack, Release, Input and Output controls, this simplicity is what we found so appealing. "With just the bare essentials on hand for each band, the EQ makes simple work of dialing in just the right amount of boost or attenuation"
In addition to the compressors, there's an entirely separate section for limiting. This one provides Brickwall Limiter, Maximizer and Standard Limiter models, each with only the barest set of parameters. Again, it's this simplicity that appeals, and it's seen yet again in the four-band EQ, which can be placed anywhere in the signal flow. With just the bare essentials on hand for each band, the EQ makes simple work of dialing in just the right amount of boost or attenuation. And that's the point: hosting a set of the most- used processing on each channel for immediate access. No digging through plugins or toggling GUIs - just get in, get the job done and make it sound good. You can draw upon a collection of Channel Strip presets, some of which were designed by US rock producer Allen Morgan. The new global Chord Track enables you to enter chords along the timeline manually or by extracting them from a MIDI track. Once you've created a chord track, any MIDI or VariAudio tracks can be made to follow along in perfect (user-defined) harmony. "This time around, Steinberg have thrown Voxengo's CurveEQ into the bundle"
This is particularly powerful when used with the updated VariAudio, which has been upgraded to version 2, with a new detection algorithm and multiple parts across a single grid. We had great fun using these tools to create new vocal melodies and harmonies from a solo vocal recording. We got our fair share of new plugins in Cubase 6.5, so we're not going to complain about the paucity of extra gadgets in 7. Besides, this time around, Steinberg have thrown CurveEQ into the bundle. Coming from Voxengo, CurveEQ is a 'smart equalizer' that can examine the frequency spectra of two signals and match one to the other. In this way, you can 'steal' the spectrum of, say, a solo'ed vocal from a professionally recorded track and apply it to your own, to make them sound more similar. "The Remote Control Editor instantly create customisable layouts for the MIDI controller of your choice"
Next up, the Remote Control Editor. This is an easily configurable generic controller editor available for VST instruments and effects. You can instantly create customisable layouts for the MIDI controller of your choice, and there are presets for some of the more popular models. It's very fast and totally intuitive. It's also worth mentioning that all plugins now have A/B comparison buttons, and that effects can now be globally bypassed. MemZap allows you to assign magnification levels and position to key controllers for quick toggling. Other tweaks to the system include ASIO Guard, using what the developers claim are 'intelligent dropout prevention algorithms' to protect against glitches. There's also a Safe-start mode that can temporarily disable custom preferences to start Cubase with its default settings, to aid troubleshooting. There are countless further brushstrokes: you can now search for tracks in busy arrangements and add customisable icons and notepad info to any channel. Fullscreen mode is also here, as is improved scalability across screens of all sizes and aspect ratios. So what's still missing? Well, we wouldn't mind an intelligent noise reduction/restoration system, but we guess we'll have to use WaveLab for that. And your computer's OS will have to be bang up-to-date to run the thing - it wouldn't install on our Snow Leopard Mac until we upgraded to Mountain Lion. Oh, and despite all the fancy new stuff in the new MixConsole, you're still stuck with a limit of eight insert effects slots. And, frustratingly, you still can't undo mixer and plugin parameter movements! If you're a longtime Cubase user, you'll be accustomed to the lack of such functionality, though that doesn't make it any less vexing. Even without such features, though, Cubase 7 represents the most complete and comprehensive version yet, as you'd hope. It's an absolutely compulsory upgrade for existing users, and very much worth checking out for everyone else.